Born: November 15, 1877 in Hampden Corner Me. 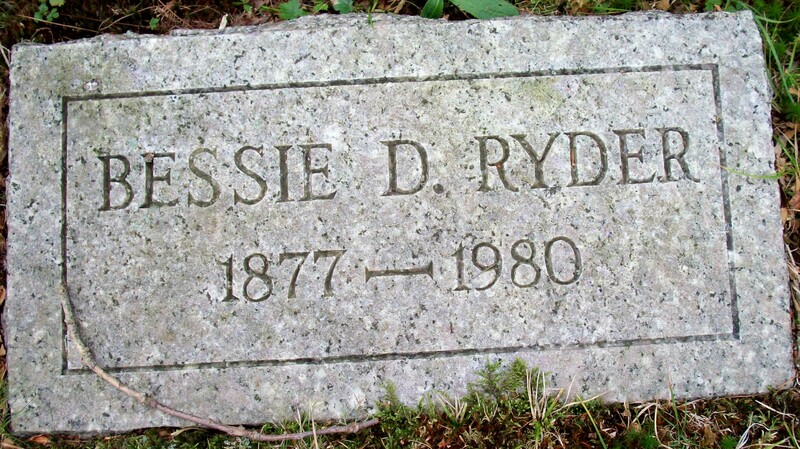 Died: December 18, 1980 in Bourne Ma. at 103 yrs. Where Lived: Maine & 187 Red Brook Harbor Rd. in Cataumet Ma. 1. Flora Chase Ryder Kingman; (February 6, 1907 – April 25, 1989); Married Thomas Barry Kingman (1909 – 1984) in Bourne Ma. on October 24, 1936; Flora was a member of Bourne High School Class of 1924; She & Thomas are buried in Cataumet Cemetery. 2. Edward Dean Ryder; (May 29, 1909 – March 4, 2005); Married Martha Sawyer Child (1913 – 1999) (Warren Garfield Child & Beulah Burt Kendrick) in Bourne Ma. 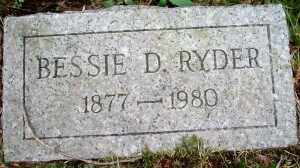 on September 12, 1936; They had 2 daughters; Edward & Martha are buried in Pocasset Cemetery.